For the past few days I have been re-organizing my crap craft yarn room. I organized it several months ago, and then it got cold outside and it all went downhill from there. You may not think that organizing an inside room has anything to do with the outside weather, but it does. When it gets cold outside, it gets cold inside and we use our wood stove, located in the living room, to do most of the heating in the house. Upstairs we leave the door to our bedroom open to benefit from the rising heat, but close the other doors. Hence, everything I might have done up there in that room, gets brought down project by project, tool by tool, pattern by pattern, yarn by yarn, needle by needle, stitch marker by stitch marker, to the living room/dining room area. And they pretty much stay there. Our dining room table becomes the temporary yarn room. We eat on the couch in the living room. If this mess bunch of knitting supplies was brought down by Paul, it would be brought right back upstairs and put in their respective drawers/cubes the minute he stopped working on them. But I’m lazier just not as organized as Paul. I prefer to let things marinate there on the table. You never know when I’m going to start working on something and at that point, what good would it have been to have brought it back upstairs when I would be just going right back up to get it? (aside from the goodness of getting some exercise that is) Also, it’s nice to have options right at my fingertips so if I get a little tired of working on something, I have something else right there to work on. And the needles and stitch markers that I would likely need are also already there. And what’s wrong with eating in the living room? Usually we want to see the news at that time anyway. You may be wondering why this is such an issue when my point seems to be that in the nice weather all those things would be up in the yarn room. So here might be a good time to admit that the dining room table kind of looks like that all the time. Not just in winter. But the yarn room stays more organized in the nice weather because it’s not an ice box and I spend more time in there. After all, we were talking about the yarn room, not necessarily the dining room, right? Does anyone feel like we’re having one of those confusing circular arguments that no one wins because no one remembers what we were fighting about? It is Collinette Iona in the Monet (#101) colorway, purchased at Grace Robinson & Company in Freeport Maine a few years ago. I just love, Love, LOVE the colors in this yarn. It is an aran weight wool, kid mohair and silk blend. Ok, I just looked up to see if they still make this yarn and it appears they don’t. However, they have several yarns, including a merino DK weight that is in this colorway. 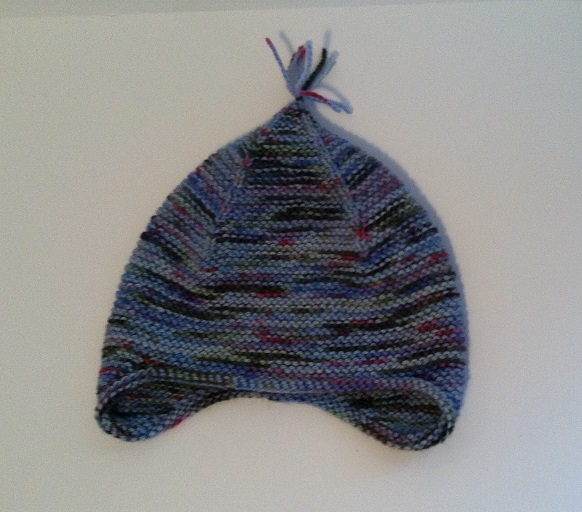 Still love this hat and will be making them for my doodlebugs for next winter. One green, one blue (their current “faaaaaaavorite” colors). And when I do make them, I will most likely get my yarn and other supplies from the dining room table yarn room. Posted in Uncategorized and tagged colinette yarns, craft room, garter ear flap hat, iona, monet colorway on February 26, 2014 by lizytish. The Colinette website is very interesting. Their story and the beautiful yarns. Wales is known for woolen woven goods, too. My friend’s mother is Welsh and always has the most distinctive and beautiful blankets, throws, runners and pillows in her home. Your organizational dilemma strikes a cord. Spring can’t come soon enough and in the meantime we could stand a thaw and milder temps. Good for the soul, the heating bill and organizing!